Tesla has been under scrutiny before over several instances of vehicles catching on fire. The media made a big deal out of it despite the fact that almost every instance happened after a high-speed accident. Statistics showed that Tesla’s vehicles caught fire significantly less often than the national average and NHTSA eventually conducted an investigation and found no problem. But on other (rarer) occasions, Tesla’s vehicles caught fire without being involved in an impact, like a Model S catching on fire during a test drive event in France and another one in Norway burned down while Supercharging. A Tesla Model S caught on fire at the Jinqiao Supercharger Station in Shanghai, China. While it was at the charging station, the vehicle reportedly wasn’t charging when it caught on fire. Last week, a 62-year-old Tesla Model S owner drove into a sign announcing a construction site on the highway in Gratkorn, Austria. The sedan continued traveling down the highway for ~200 meters before coming to a stop and bursting into flames, according to local media reports (German). Last month, we reported on a Tesla Model S catching on fire during a test drive event in France. All 3 occupants, a couple that was test driving the car and a Tesla employee, were able to exit in time thanks to the vehicle sending out an alert warning them of a problem. As part of its ‘Electric Road Trip’ tour for the summer, Tesla stopped in Biarritz, France to promote Model S and Model X over the weekend. During a test drive in a Model S 90D, the vehicle suddenly made a loud noise and sent a visual alert on the dashboard stating that there was a problem with “charging”. The Tesla employee giving the test drive made the driver park the car on the side of the road and all three (the driver, the Tesla employee and another passenger) exited the vehicle. Currently, a Model S has a 1 in 2.5 million chance of burning down while charging at a Tesla Supercharger but that’s really not something Tesla owners need to worry about. This statistic is simply based on the fact that Superchargers have been used 2.5 million times with only one report of a fire earlier this year in Norway. Though it was quite a significant fire, burning the car to the ground, no one fortunately was injured. 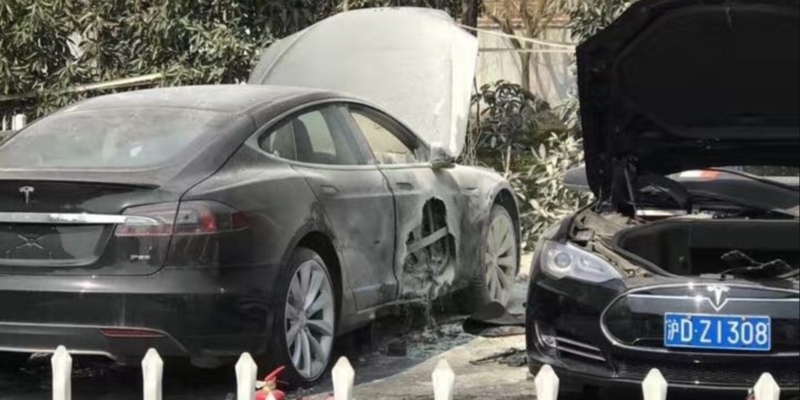 We have been following the investigations, which have not been very fruitful – likely due to the condition of the vehicle, but the authorities believe that the fire originated “inside the vehicle” and not from the Supercharger itself.